She wants to get back to Italy. Does she have a ghost of a chance? Paige Murphy loves her new life in Italy, where she can sip wine, eat pasta, and while the days away working on her romance novel. But all that changes when her beloved aunt falls ill, and she must fly back home to Texas—a place she thought she’d left behind. In a blink, she finds herself with a failing beachside bookstore, jealous cousins out to get her, and pesky suitors who won’t leave her alone. As if that wasn’t enough, buried treasure and hidden secrets could prove to be deadly! 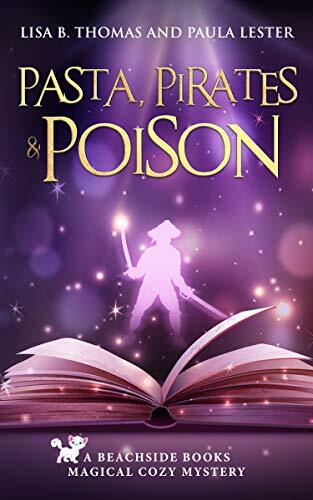 Pasta, Pirates and Poison is Book 1 in the Beachside Books Magical Cozy Mystery Series. If you like paranormal cozy mysteries (with a cat), you’ll love this light-hearted, fun read.